Fabulous :"Love this and so do my two cats. Needed a cat basket/bed that was off the floor and this is perfect. Very stylish. Well worth the money." Banana leaf - a rediscovered natural material; in many cultures, this material is an important part everyday life. Woven together by hand to create elaborate and beautiful furniture, banana leaves embody nature in a unique way. The unique character of this natural material gives Banana Leaf furniture a special aesthetic character that tempts people as well as pets, offering a feeling of both security and relaxation. 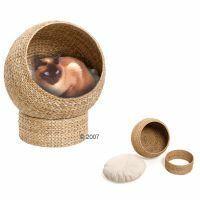 Round and elegant, warm and natural, this lovely cat furniture enriches any interior. Karlie Banana-Leaf Sleeping Den is a truly classy and comfortable place for your cat to sleep and relax. This cozy den is extremely durable and stable, and comes complete with a cushion made from premium linen. Love this and so do my two cats. Needed a cat basket/bed that was off the floor and this is perfect. Very stylish. Well worth the money. a really lovely looking cat bed that the cats love, we have it in the porch and on sunny days they love it. its really well made, looks fab, and gets a good bit of use. i would really recommend it! 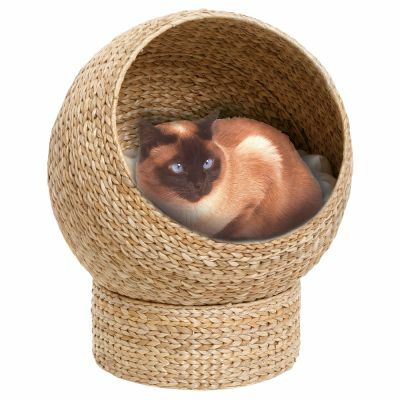 Bought this for my new rescued Birman Charlie. A complete indulgence, but it is so smart! Looks good, especially with him in it, is well made and the cushion is very soft. He is certainly not complaining and is very happy. First of all - I have the kind of cat that hates anything that is made for cats!! She is 17 yrs old now and knows what she likes!! Always one to prefer my bed to sleep in than a cat bed... a shoe lace to play with rather than any cat toy, so I kind of went out on a limb buying this - especially as it's not that cheap! Just like a few of the other customers stated, it also took my cat a few weeks (maybe even a couple of months) to get used to this! I think at first she wasn't sure about the cushion, so I put a cushion in there she did like, but I also got her used to the cushion by leaving it infront of the fire (her favourite place) until she loved the cushion... then I put the cushion back in and slowly but surely she went in and stayed in... now she looks so happy and comfy in there I wish I had one of my own!!!! I am sooo happy I bought this - and it makes me smile every time I see her in there! .... I'm still waiting for her to choose this bed over mine though.... I've not managed to persuade her to sleep on her own at night yet! Still working on it!! I used my ever -accumulating zooplus points to offer a cozy niche to my two critters only for it to be completely and brutally ignored! The cats much prefer snoozing on my bed or on the sofa.... The upside, at least I didn't pay for it! Now I'm stuck with this wicker igloo! Still, as far as cat beds go, it's one of the most aesthetically pleasing on the market - I suppose it all depends on the individual fussiness of the moggie in question. As I write, the cats are having way more fun in the box it was delivered in!! The perfect addition to any lounge, conservatory, kitchen/diner!! Looks as good as the picture and I'm sure my kitten will love it! All I need now is the cat :-) plus fast delivery - I am really impressed. We have 5 cats and they all want to get in this bed,so much that they even hiss at each other! Quite pricey, but well made an looks good. Wow what a lovely cat bed!!! This cat basket looks fantastic, but my cats won't go near it. One of them wee'd on the cushion on the first night (which I then threw away and replaced with their regular bed) but they won't go into it. I don't know if it's because it's not very stable or if they don't like the smell It's a shame, because it really is a well made product. Yes, this is expensive, but worth every penny in terms of looks and practicality. I have 3 cats. one is a Bengal boy, very big and heavy. He loves sleeping in the den whilst the 2 girls love standing on top. It looks great and fits into a modern décor extremely well. My 2 young cats, a brother and sister love to snuggle up together in this. It is also a very stylish piece of furniture which doesn't look out of place in your living room, and as it is scratch proof stays looking good without bits hanging off it. I am so pleased with it I have just purchased a banana leaf sofa for my old lady cat who cannot jump up into this. My two kittens sleep in this and love to play on it. Bo will sit on the top and peep over the edge at her brother, Indy. They also use it as a scratching post. Good job it is scratch resistant! I have had it for a month now and it still looks new inspite of the daily scratching. This banana-leaf furniture is an excellent idea as it is visually very pleasing and blends in anywhere in the house. It is a very beautiful cat bed and worth every penny. My 2 new kitten just love this bed, it is very well made, and looks so cosy inside. They took to it straight away, and it also looks great in my dining room as is like a piece of furniture. It was delivered in 5 days by GLS, and was in great condition even though the outer box was badly bashed and covered in what looked like grease/oil. This is worth every penny,very pleased. Excellent quality as usual. Yes, this is expensive, but worth every penny in terms of looks and practicality. I have 2 british blues, the female loves sleeping in the den whilst the male loves standing on top of it. It looks great and fits into a modern decor extremely well. this bed is at terribel pricing !!! but it is the most beautful thing i have ever seen!!!!!!!!!!!!!!!!!!!!!!!!!!!!!!!!!!!!!!!! !